Recent evidence suggests that progesterone metabolites play important roles in regulating breast cancer. Previous studies have shown that tumorous tissues have higher 5α-reductase (5αR) and lower 3α-hydroxysteroid oxidoreductase (3α-HSO) and 20α-HSO activities. The resulting higher levels of 5α-reduced progesterone metabolites such as 5α-pregnane-3,20-dione (5αP) in tumorous tissue promote cell proliferation and detachment, whereas the 4-pregnene metabolites, 4-pregnen-3α-ol-20-one (3αHP) and 4-pregnen-20α-ol-3-one (20αDHP), more prominent in normal tissue, have the opposite (anti-cancer-like) effects. The aim of this study was to determine if the differences in enzyme activities between tumorous and nontumorous breast tissues are associated with differences in progesterone metabolizing enzyme gene expression. Semi-quantitative RT-PCR was used to compare relative expression (as a ratio of 18S rRNA) of 5αR type 1 (SRD5A1), 5αR type 2 (SRD5A2), 3α-HSO type 2 (AKR1C3), 3α-HSO type 3 (AKR1C2) and 20α-HSO (AKR1C1) mRNAs in paired (tumorous and nontumorous) breast tissues from 11 patients, and unpaired tumor tissues from 17 patients and normal tissues from 10 reduction mammoplasty samples. Expression of 5αR1 and 5αR2 in 11/11 patients was higher (mean of 4.9- and 3.5-fold, respectively; p < 0.001) in the tumor as compared to the paired normal tissues. Conversely, expression of 3α-HSO2, 3α-HSO3 and 20α-HSO was higher (2.8-, 3.9- and 4.4-fold, respectively; p < 0.001) in normal than in tumor sample. The mean tumor:normal expression ratios for 5αR1 and 5αR2 were about 35–85-fold higher than the tumor:normal expression ratios for the HSOs. Similarly, in the unmatched samples, the tumor:normal ratios for 5αR were significantly higher than the ratios for the HSOs. The study shows changes in progesterone metabolizing enzyme gene expression in human breast carcinoma. Expression of SRD5A1 (5αR1) and SRD5A2 (5αR2) is elevated, and expression of AKR1C1 (20α-HSO), AKR1C2 (3α-HSO3) and AKR1C3 (3α-HSO2) is reduced in tumorous as compared to normal breast tissue. The changes in progesterone metabolizing enzyme expression levels help to explain the increases in mitogen/metastasis inducing 5αP and decreases in mitogen/metastasis inhibiting 3αHP progesterone metabolites found in breast tumor tissues. Understanding what causes these changes in expression could help in designing protocols to prevent or reverse the changes in progesterone metabolism associated with breast cancer. In vitro metabolism studies have shown that mammary tissue from mouse [1, 2], rat [3–5], cat , dog [6, 7] and human [8–10] can convert progesterone to metabolites whose formation requires the action of the enzymes, 5α-reductase (5αR), 3α-hydroxysteroid oxidoreductase (3α-HSO) and 20α-HSO. Differences between normal and tumor mammary gland tissues in the progesterone metabolizing enzyme (PME) activities have been noted [2, 3, 8–10]. Our recent observations indicate that 5α-reduced metabolites (5α-pregnanes) are produced at a significantly higher rate in tumorous than in nontumorous human breast tissue, indicating increased 5αR activity in the carcinoma. Conversely, the activities of 3α-HSO and 20α-HSO were higher in histologically non-tumorous breast tissues which produce more δ-4-pregnenes . These observations are of particular interest because the 5α-pregnanes and 4-pregnenes have been demonstrated to exhibit opposing effects associated with breast neoplasia. Specifically, exposure of human breast cell lines to 5α-pregnanes results in increased proliferation and decreased attachment , depolymerization of F-actin  and decreases in adhesion plaque-associated vinculin . In contrast, exposure to the 4-pregnenes results, in general, in opposite (anti-cancer-like) effects by causing suppression of cell proliferation and detachment [10, 11]. Additionally, specific high-affinity receptors for the 5α-pregnane, 5α-pregnane-3,20-dione (5αP) and the 4-pregnene, 3α-hydroxy-4-pregnen-20-one (3αHP), have been identified in the plasma membrane fractions but not in the intracellular compartments of breast cancer cells . The plasma membrane-associated 5αP and 3αHP receptors are distinct from each other and from the classical intracellular androgen, estrogen, progesterone and corticosteroid receptors . These results suggest important and distinct cancer regulating functions for endogenous progesterone metabolites and emphasize a potentially prominent role for the PMEs expressed in breast tissues. We have recently also shown that 5α-reductase activity is higher, whereas 3α-HSO and 20α-HSO activities are lower in the tumorigenic cell lines, MCF-7, MDA-MB-231, and T-47D, than in the nontumorigenic, MCF-10A, cell line . The differences in enzyme activities between the tumorigenic and nontumorigenic cell lines are correlated with differences in levels of mRNA expression  of 5α-reductase type 1 (5αR1; SRD5A1), 20α-HSO (AKR1C1), 3α-HSO type 2 (3α-HSO2; AKR1C3) and 3α-HSO type 3 (3α-HSO3; AKR1C2). A recent study  also noted that 3α-HSO type 3 (AKR1C2) mRNA expression is lower in prostatic adenocarcinoma than in normal human prostate tissue. Taken together, these findings suggest important autocrine/paracrine cancer regulating functions for progesterone metabolites and suggest regulatory roles for 5αR, 3α-HSO and 20α-HSO activities in human breast cancer progression. The etiology of PME activity changes during breast carcinogenesis is not known. The objective of the current studies was to determine if PME gene expression levels have been altered in breast tumorigenesis. 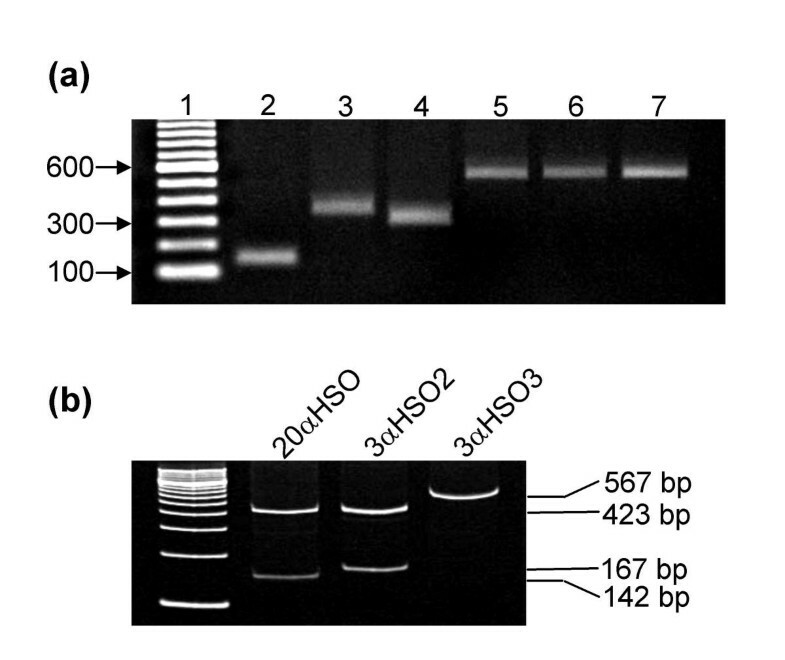 To this end, reverse transcription (RT) polymerase chain reaction (PCR) was used to quantify expression levels of 5αR1, 5αR2, 20α-HSO, 3α-HSO2 and 3α-HSO3 in paired (tumorous and nontumorous) tissues from 11 patients, and unpaired tumor tissues from 17 patients and nontumorous breast tissues from 10 reduction mammoplasty samples. The results provide the first evidence that expression levels of SRD5A1/2 are elevated whereas those of AKR1-3 are markedly decreased in breast carcinoma. The findings suggest that selective changes in specific PME expression levels could lead to local increases in carcinoma-promoting 5αP and decreases in carcinoma-inhibiting 3αHP and 20αDHP in breast cancer tissue. Tissues were obtained from Tissue and Archives Committee, Department of Pathology, London Health Sciences Centre, London, Ontario. They were previously collected (1995–1999) tissues that had been stored in liquid nitrogen freezers. The tissues were provided after being anonymized and their use for these studies was approved by the Interagency Advisory Panel on Research Ethics and the local Institutional Ethics Review Board. The tissues are numbered arbitrarily for convenience in these investigations. Paired samples were obtained from 11 patients and in each case consisted of a tissue sample from the tumor biopsy and a sample of tissue away from the tumor (nontumor tissue). Histological examination of the grossly normal breast tissue confirmed the absence of carcinoma or significant lymphocyte infiltration. Pathologists graded the tumors by the Scarff-Bloom-Richardson (SBR) histological grading system as part of their routine evaluation. The degree of lymphocytic infiltration was evaluated separately using a semi-quantitative method. Estrogen (ER) and progesterone (PR) receptors were assayed in cytosols prepared from quick frozen tissues using quantitative enzyme immunoassay kits purchased from Abbott Laboratories (Abbott Park, IL). Table 1 gives details of patients and tumor tissues of the paired samples. In addition, 17 tumor samples (without matching nontumor tissue) and 10 samples from reduction mammoplasty specimens were also examined for enzyme messenger RNA (mRNA) expression levels. Patient and biopsy information from the tumors of paired (tumor and normal from the same breast) tissue samples. RNA isolation and reverse transcription (RT) was as described . Briefly, the procedure was as follows. Total RNA was isolated from the tissues by homogenization in TRIzol® reagent (Invitrogen) and extraction following the manufacturer's instructions. Prior to reverse transcription, RNA was treated with DNase I for 30 minutes at 37°C using a DNA-free™ kit (Ambion). Complementary DNA (cDNA) was obtained from 2.0 μg of DNase treated total RNA using 200 U Moloney Murine Leukemia Virus (MMLV) reverse transcriptase (Invitrogen) and random hexamer primers (Invitrogen) in a total volume of 20 μl following the manufacturers instructions. To exclude any amplification of genomic DNA, all experiments included conditions in which the reverse transcriptase enzyme was omitted. In addition, no template (NT) controls were run for both the RT and PCR stages for each of the primer sets and none showed any visible PCR product. All PCR primers were purchased from Invitrogen Canada (Burlington, ON) and primer sequences, PCR conditions, PCR reaction kinetics and quantification were determined as previously described . The conditions were as follows: 95°C denature for 4 minutes followed by cycling, each cycle with a 20 second denature at 94°C, a 30 second anneal at 62°C, and a 30 second extension at 72°C. Cycling was followed by a final extension for 4 minutes at 72°C. For each reaction an aliquot of cDNA was amplified in a 25 μl total volume using 1.25 U of Platinum Taq DNA Polymerase (Invitrogen), 2 mM MgCl, 0.2 mM dNTP's, and 2 mM primer. Samples were amplified in separate reactions for 12 cycles with the 18S ribosomal RNA (rRNA) primers, 27 cycles with the 5αR1, 20α-HSD, 3α-HSD1, 3α-HSD2 and 3α-HSD3 primers, and 33 cycles with the 5αR2 primers. Prior studies had shown that under these cycling conditions, quantification was linear over an 8-fold range . The PCR products were separated on 9% polyacrylamide gels and visualized using ethidium bromide staining. The bands were quantified by Quantity One 4.2.1 Gel Doc Software (BioRad Laboratories). The quantity of each band is expressed as total pixel value, based on intensity and number of pixels per band. Results are given as ratios of the total pixel value of the band of interest to the total pixel value of the 18S band. Values were obtained from the average of duplicate PCRs run on the same gel and assays were repeated three times for each gene, using a fresh cDNA sample each time. Results are given as mean ± SEM. Data were analyzed either by Student's t test for two columns or by ANOVA followed by Student-Newman-Keuls test comparing all columns. Differences were considered significant if p < 0.05. Table 1 summarizes information on the eleven patients and the tumor portion from each paired tissue. The ages of the women at the time of surgery ranged from 34 to 75 years. The tumorous tissues were diagnosed as infiltrating ductal carcinomas of no special type. They were graded by the Scarff-Bloom-Richardson (SBR) histological grading system, whereby two carcinomas were Grade II/III and nine were III/III. Estrogen (ER) and progesterone (PR) receptor information was available for 10 of the tumor tissues. Eight tumor tissues were ER- and PR-negative, two were ER- and PR-positive, and one was ER-positive and PR-negative. ER and PR concentrations were graded as indicated in Table 1. Two of the patients had axillary lymph nodes that contained metastases. On pathological examination, tumor was found to occupy from 25% – 75% of the frozen tissue. Normal breast parenchyma occupied from 5% – 15% of the normal breast sample with the bulk of the tissue composed of fibrous tissue and fat. Lymphocyte infiltration ranged from mild to heavy in the tumor samples and was essentially absent in the normal (nontumorous) tissues. Figure 1 shows that mRNA expression of 5αR1 (SRD5A1) mRNA, 5αR2 (SRD5A2) mRNA and 18S rRNA were detected as single bands (368 bp for 5αR1; 315 bp for 5αR2 and 131 bp for 18S) by our RT-PCR protocol. Product identities were confirmed by agarose gel electrophoresis and PCR product sequencing (Robarts Research Institute sequencing facility, London, Ontario). Figure 1 also shows detection of 20αHSO (AKR1C1), 3αHSO type 3 (3α-HSO3; AKR1C2) and 3αHSO type 2 (3α-HSO2; AKR1C3) mRNA's as single bands (591 bp for AKR1C1, and 590 bp for AKR1C2 and AKR1C3). AKR product identities were confirmed by agarose gel electrophoresis, PCR product sequencing and double restriction enzyme digestion with PvuII and BAMHI. Restriction digestion with these enzymes produces three fragments for AKR1C1 (423 bp, 142 bp and 26 bp), two fragments for AKR1C2 (567 bp and 23 bp) and two fragments for AKR1C3 (423 bp and 167 bp) as shown in Figure 1b. Visualization of reverse transcribed (RT) mRNA from human breast tissue that was PCR amplified with primers specific for progesterone metabolizing enzyme genes. (a) The PCR products were initially identified by separation on a 1.5% agarose gel. The products and number of cycles are as follows: Lane 2, 18S rRNA (12 cycles), Lane 3, 5αR1 (26 cycles), Lane 4, 5αR2 (33 cycles), Lane 5, 20αHSO (27 cycles), Lane 6, 3αHSO2 (27 cycles), and Lane 7, 3αHSO3 (27 cycles). (b) Restriction of the HSOs with PvuII and BamHI resulted in different fragments for 20α-HSO (lane 2; 423 bp, 142 bp), for 3α-HSO2 (lane 3; 423 bp and 167 bp) and for 3α-HSO3 (lane 4; 567 bp) when separated on a 9% polyacrylamide gel. The 26 bp fragments for 20α-HSO and 3α-HSO3 are not shown on the gel image. Figure 2 shows examples of RT-PCR analyses of matched tumorous and nontumorous tissues from five patients for mRNA expression of 5αR1, 5αR2, 20α-HSO, 3α-HSO2 and 3α-HSO3 in relation to 18S rRNA expression. The images show that 5αR1 and 5αR2 mRNA expression was higher in tumor tissue than in nontumor tissue, whereas expression of 20α-HSO, 3α-HSO3 and 3α-HSO2 mRNAs was higher in nontumorous (normal) than in tumor tissue. Representative RT-PCR results (gels) for 5 of the 11 tumor and paired normal breast tissue samples. For each tissue, 2 μg of total RNA was reverse transcribed using random primers, and aliquots of cDNA were PCR amplified, as described in the methods, with each of 6 primer sets. For each tissue, separate cDNA samples were amplified with primers specific to 18S rRNA (12 cycles), 5αR1 primers (27 cycles), 5αR2 (33 cycles), 20α-HSO, 3α-HSO2 and 3α-HSO3 (27 cycles each). Products were separated on 9% polyacrylamide gels. Note that intensity and abundance of 5αR1 and 5αR2 bands is greater, whereas that of the HSO bands is less in tumor than paired normal tissue samples. Quantitative analyses of the enzyme mRNA expressions (as ratios against respective 18S rRNA) from the paired tissues (tumor and nontumor [normal]) from the 11 patients are shown in Table 2. Tissues from 11/11 patients showed higher levels of 5αR1 (SRD5A1) expression in tumor than in the normal tissue. The mean (±SEM) expression value of 5αR1 for the tumorous tissues (3.496 ± 0.43) was significantly higher (p < 0.0001) than for the paired nontumorous tissues (0.709 ± 0.147). Tissues from 10/11 patients showed higher levels of 5αR2 (SRD5A2) expression in tumor than in the normal tissue. The mean (±SEM) expression value of 5αR2 for the 11 tumorous tissues (2.139 ± 0.326) was significantly higher (p = 0.0002) than for the paired nontumorous tissues (0.614 ± 0.105). Tissues from 9/11 patients showed lower levels of 20α-HSO (AKR1C1) expression in tumor than in the normal tissue. The mean (±SEM) expression value of 20α-HSO for the 11 tumorous tissues (1.044 ± 0.217) was significantly lower (p = 0.0001) than for the paired normal tissues (4.627 ± 0.604). Tissues from 10/11 patients showed lower levels of 3α-HSO3 (AKR1C2) expression in tumorous than in the paired nontumorous tissue. The mean (±SEM) expression value of 3α-HSO3 for the 11 tumorous tissues (1.191 ± 0.472) was significantly lower (p = 0.0005) than for the paired nontumorous tissues (4.685 ± 0.667). Tissues from 10/11 patients showed lower levels of 3α-HSO2 (AKR1C3) expression in tumorous than in the paired nontumorous tissue. The mean (±SEM) expression value of 3α-HSO2 for the 11 tumorous tissues (1.905 ± 0.473) was significantly lower (p < 0.0001) than for the paired nontumorous tissues (5.296 ± 0.644). Expression levels of progesterone metabolizing enzymes (standardized against 18S mRNA) in tumorous and non-tumorous (Normal) resected breast tissues from 11 patients (described in Table 1). Values were obtained from the average of duplicate PCRs run on the same gel and assays were repeated three times for each gene, using a fresh cDNA sample each time. Values are presented as mean ± SEM, n = 3. a Values were obtained by dividing the calculated intensity of 5αR1 or HSO bands (27 cycles) by the calculated intensity of the 18S band (12 cycles). b Values were obtained by dividing the calculated intensity of 5αR2 bands (33 cycles) by the calculated intensity of the 18S band (12 cycles). c Values obtained from very faint bands, calculated as <0.1, were adjusted to 0.1. The changes in progesterone metabolizing enzyme expression levels due to carcinoma are shown (Figure 3) by the Tumor:Normal (T/N) ratios calculated for each of the matched tissues. The mean T/N expression ratios (±SEM) for 5αR1 and 5αR2 were 7.838 (±2.026) and 6.055 (±2.667), respectively, which were significantly higher (p < 0.01 for 5αR1 and p < 0.05 for 5αR2) than the T/N ratios for 20α-HSO (0.355 ± 0.116), 3α-HSO2 (0.48 ± 0.17) and 3α-HSO3 (0.443 ± 0.241). Based on the overall means (shown in Fig. 3), the T/N expression of 5αR1 was about 22-fold, 16-fold and 18-fold higher than the T/N expression of 20α-HSO, 3α-HSO2 and 3α-HSO3, respectively. When calculations are based on comparisons within individual pairs of (tumor and normal) tissues, the T/N expression of 5αR1 was 3–207-fold (mean ± SEM: 52.5 ± 18.5), 4–132-fold (mean ± SEM: 32.9 ± 11.6) and 3–308-fold (mean ± SEM: 129.6 ± 48.6) higher than the T/N expression of 20α-HSO, 3α-HSO2 and 3α-HSO3, respectively (data not shown). Similarly, the T/N expression ratios for 5αR2 were on average 33–86-fold higher than the T/N expression ratios of the HSOs. Gene expression levels of progesterone metabolizing enzymes in paired (tumor versus normal) human breast biopsies. Expression level of each gene (in relation to 18S rRNA) was calculated as a tumor/normal ratio for each patient. Each bar and line represents the mean ± SEM of 11 paired tissue samples. * indicates significantly different from 5αR1 at p < 0.01 and from 5αR2 at p < 0.05 (by ANOVA and Student-Newman-Keuls test). The 5αR1/HSO expression ratios were less than 1.0 in normal breast tissue and significantly (about 12–16-fold; p < 0.001) higher in the paired tumorous breast tissues (Figure 4). Similarly, 5αR2/HSO expression ratios were significantly (p < 0.05) higher in tumorous than in normal tissues (data not shown). Expression level of 5αR1 with respect to expression level of HSO (5αR1/HSO ratio) in paired tumor and normal breast tissues. 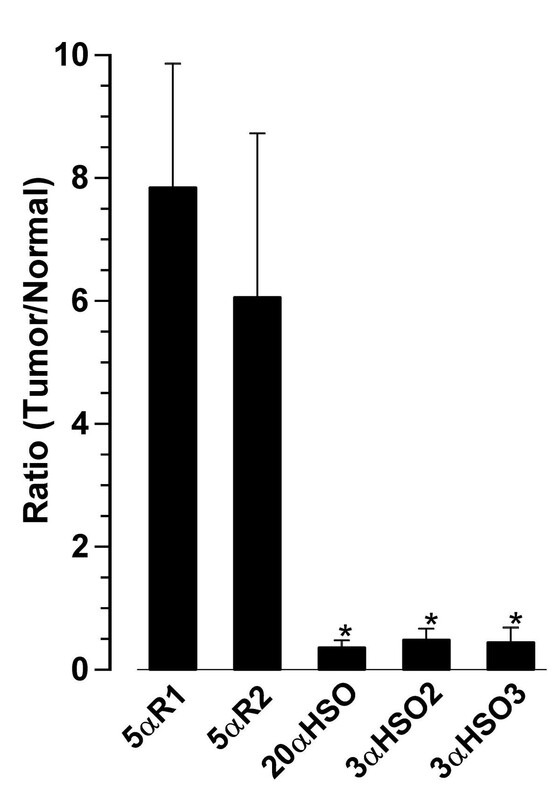 Each bar and line represents the mean ± SEM of the ratio for normal (adjusted to 1.0) and tumor. *** indicates significantly different from normal at p < 0.001, n = 11. After the completion of the study a real-time PCR unit (Rotor Gene 3000) became available and expression levels of 5αR1 and 5αR2 (with respect to 18S rRNA) were determined on the only remaining RNA samples (from paired tissues of patients #1, #7 and #8). Expression of 5αR1 by real-time measurement, was 18.5-, 1061- and 12.5-fold higher in tumor than in normal samples from #1, #7 and #8, respectively (compared to 3.3-, 22- and 8-fold higher, respectively, by the semi-quantitative method. 5αR2 expression was higher by 6.6-, 140- and 1.3-fold by real-time measurement, (compared to 1.8-, 8.8- and 1.2-fold higher by the semi-quantitative method) in tumor than normal samples of #1, #7 and #8, respectively. The real-time results confirmed the findings by the semi-quantitative method that 5αR mRNA expression levels are higher in tumor than in normal tissue. The differences between the two methods may be due to the fact that the real-time measurements are linear over a much wider range than the 8-fold limit of the semi-quantitative method. The real-time determinations suggest that the changes in progesterone metabolizing enzyme expression that accompany breast carcinoma may be even greater than indicated by the semi-quantitative results. The unpaired tissues consisted of breast carcinomas from 17 patients and normal (reduction mammoplasty) from 10 cases. The tumor tissues came from women whose ages at the time of surgery ranged from 48 to 91 years. Four of the tumor tissues were ER- and PR-negative, ten were ER-positive and PR-positive at varying receptor levels, and three were ER-positive and PR-negative. There were no evident relationships between ER/PR status and enzyme gene expression levels. Available SBR scores were Grade I for two tissues, Grade II for two tissues and Grade III for seven tissues. No apparent relationships between SBR scores and enzyme gene expression levels were detected. Of the ten samples of normal tissue three patients were just under 20 years, five were between 24 and 35 years and two were between 47 and 53 years of age. No ER or PR data were available for these tissues. 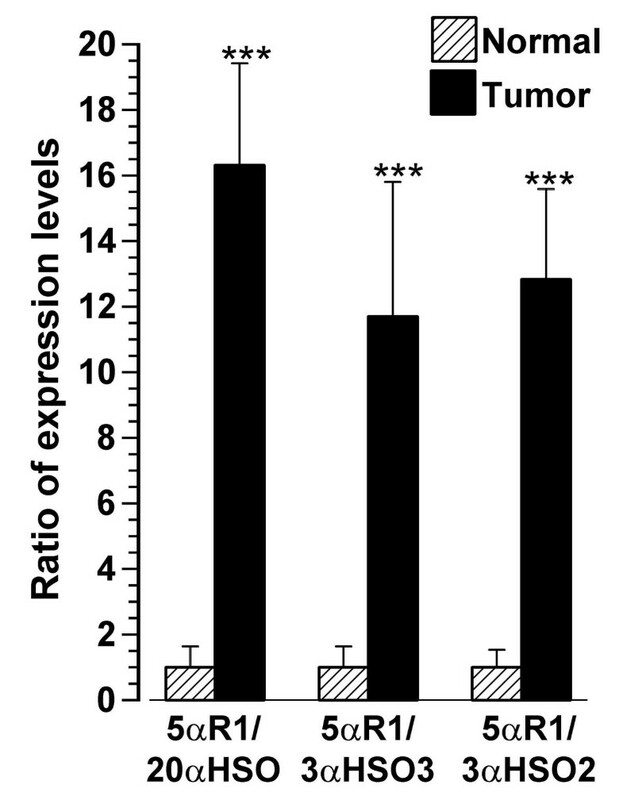 Messenger RNA expression levels for progesterone metabolizing enzymes in tumor and reduction mammoplasty ('normal') tissues are presented in Figure 5. The calculations for expression levels of 5αR1, 20α-HSO, 3α-HSO3 and 3α-HSO2 are based on 27 PCR cycles. Expression levels of 5αR2 were considerably lower than expression of mRNA for the other enzymes studied, requiring 34 cycles instead of 27 to visualize in the linear calculation range. The average level of expression of 5αR1 mRNA was not significantly different between tumor and normal tissues. The average level of expression (mean ± SEM) of 5αR2 mRNA was more than 2-fold higher (p < 0.01) in tumor (1.28 ± 0.17) than in normal (0.604 ± 0.12) tissues. The average level of expression of 20α-HSO mRNA was significantly lower (p < 0.01) in tumor (0.374 ± 0.048) than in normal (1.942 ± 0.691). The average level of expression of 3α-HSO3 mRNA was significantly lower (p < 0.01) in tumor (0.382 ± 0.094) than in normal (1.793 ± 0.641). The average level of expression of 3α-HSO2 mRNA was significantly lower (p < 0.01) in tumor (0.706 ± 0.123) than in normal (1.639 ± 0.399). Gene expression of progesterone metabolizing enzymes in unpaired breast carcinoma and normal (mammoplasty) tissue samples. Expression level of each gene (in relation to 18S rRNA) from 17 tumor and 10 normal tissue samples is presented as mean ± SEM. ** indicates significantly different from normal at p < 0.01. The 5αR1 expression level was compared with each of the HSO expression levels for each tissue and the mean ratios (5αR1/HSO) were significantly higher (p < 0.001 or p < 0.01) for tumor tissues than for normal tissues (Figure 6). The ratio of 5αR1:20α-HSO was greater than 1.0 in 17/17 tumor tissues (mean = 3.186; 95% CI = 2.285 and 4.086) and less than 1.0 in 6/10 normal tissues (mean = 0.867; 95% CI = 0.499 and 1.235). The ratio of 5αR1:3α-HSO3 was greater than 1.0 in 16/17 tumor tissues (mean = 4.732; 95% CI = 2.833 and 6.63) and less than 1.0 in 5/10 normal tissues (mean = 1.205; 95% CI = 0.432 and 1.978). The ratio of 5αR1:3α-HSO2 was greater than 1.0 in 12/17 tumor tissues (mean = 2.34; 95% CI = 1.433 and 3.247) and less than 1.0 in 9/10 normal tissues (mean = 0.683; 95% CI = 0.462 and 0.903). Similarly, in the non-paired tissues, 5αR2/HSO ratios were greater than 1.0 in tumor and less than 1.0 in normal tissues and the differences were significant at p < 0.001 (data not shown). 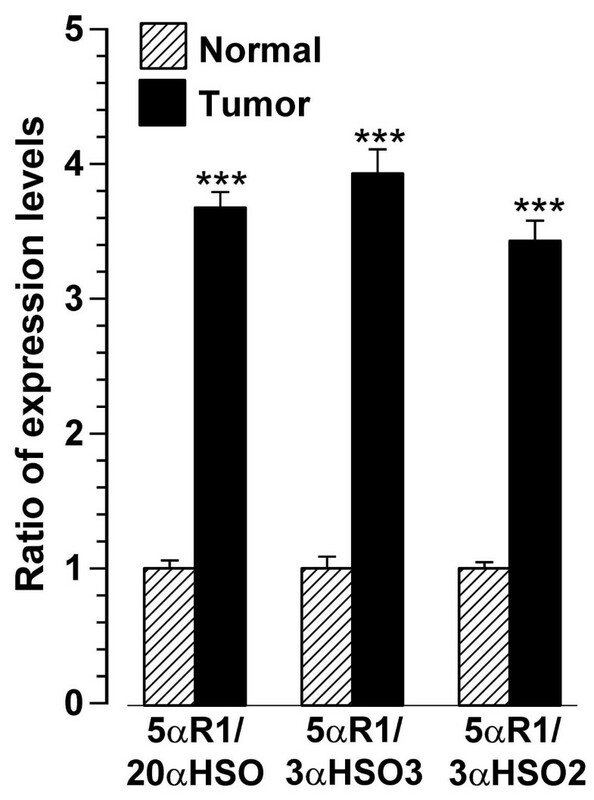 Expression level of 5αR1 as a ratio of HSO expression level in unpaired tumor and normal (mammoplasty) breast tissues. Each bar and line represents the mean ± SEM of the ratio for normal (adjusted to 1.0; n = 10) and tumor (n = 17) tissues. *** indicates significantly different from normal at p < 0.001. Metabolism studies have shown that mammary tissues from several species [1–6] including human [8–10] and several human breast cell lines [13, 15] exhibit 5αR, 3α-HSO, 3β-HSO and 20α-HSO progesterone metabolizing activities. Differences between tumorous and nontumorous breast tissue in terms of relative activities of 5αR, 3α-HSO and 20α-HSO have been observed [2, 8–10]. Significantly higher levels of 5α-reduced progesterone metabolites (5α-pregnanes) and significantly lower levels of delta-4 metabolites (4-pregnenes) are produced in tumorous than in nontumorous human breast tissue . Similarly, tumor-inducing breast cell lines produce significantly higher ratios of 5α-pregnanes:4-pregnenes than do nontumorigenic cell lines . In the progesterone conversion pathway, the first 5α-reduced metabolite is 5αP, catalyzed by 5α-reductase activity (Figure 7). The two 4-pregnenes resulting from direct progesterone conversion are 4-pregnen-3α-ol-20-one (3αHP) and 4-pregnen-20α-ol-3-one (20αDHP), catalyzed by the actions of 3α-HSO and 20α-HSO, respectively (Figure 7). The conversion to 5αP is irreversible. The conversions to 3αHP and 20αDHP are reversible and depend on the relative reductive or oxidative activities of each enzyme. Progesterone metabolizing enzyme pathways and primary metabolites affected by altered gene expression in breast carcinoma tissue. (3αHP: 4-pregnen-3α-ol-20-one; 20αDHP: 4-pregnen-20α-ol-3-one; 5αP: 5α-pregnane-3,20-dione). The potential significance for breast cancer of the changes in progesterone metabolizing enzyme activities is that the metabolites appear to be directly involved in promoting or inhibiting tumor growth in this tissue. The 5α-pregnane, 5αP, which is produced at higher levels in tumorous tissues, stimulates cell proliferation and inhibits cell anchorage [10, 11]. The action of the neoplasia-promoting 5αP involves novel, specific, high-affinity receptors in the cell membrane  and results in marked alteration of the cell's cytoskeletal and adhesion complexes normally involved in cell replication and attachment . On the other hand, the 4-pregnene, 3αHP, which is produced at higher levels in the normal breast tissue, has the opposite effect by suppressing cell proliferation and detachment [10, 11] via separate and distinct membrane receptors . Changes in enzyme activity can result from changes in the milieu in which the enzymes operate (such as temperature and pH, and concentrations of cofactors, substrates, products, competitors, ions, phospholipids and other molecules). Changes can also occur because of changes in actual enzyme amounts due to changes in the expression of the mRNA coding for the enzyme. Since the progesterone metabolizing enzyme activity studies  on tumorous and nontumorous breast tissue were carried out in vitro in identical milieus, the observed differences can be more easily ascribed to differences in enzyme amounts resulting from altered expression. A recent study on breast cell lines has shown that differences in progesterone metabolizing enzyme activity can be correlated with changes in enzyme mRNA expression . The present study indicates that changes in the mRNA expression of various progesterone metabolizing enzymes may be responsible for the previously reported  higher levels of 5α-pregnanes and lower levels of 3α- and/or 20α-hydroxy 4-pregnenes produced by tumorous human breast tissue. The enzyme responsible for the conversion of 4-ene steroids to 5α-reduced steroids is 5α-reductase (5αR; EC 1.3.99.5). Two isoforms of 5αR have been cloned and characterized in mammals, namely type 1 (5αR1) and type 2 (5αR2) [16, 17]. 5αR1, which is encoded by the SRD5A1 gene has an optimum pH of 6–9, whereas 5αR2, encoded by the SRD5A2 gene, has an optimum pH of 5.5 . 5αR1 has been detected in various androgen-independent organs, such as the liver and brain . 5αR2 has been found predominantly in androgen-dependent organs, such as epididymis and prostate [17, 19]. Recently 5αR1 and 5αR2 have also been located in human breast carcinoma where they were studied in relation to 5α-reduction of testosterone . In the present study we observed mRNA expression for both 5αR1 and 5αR2 in all tissues examined. The studies on the paired samples show significantly higher levels of expression of 5αR1 and 5αR2 in tumorous than in the normal (nontumorous) breast tissue biopsies (Table 2 and Fig 3). Such an increase in expression of 5αR could account for the higher levels of progesterone 5α reduction in the tumorous portion of matched breast samples that resulted in significantly higher levels of 5αP production . In breast cell lines the higher 5αR activity level in the tumorigenic cells , appeared to be attributable to 5αR1 since its mRNA expression was several hundred fold greater than that of 5αR2; seven more PCR cycles were required for 5αR2 in order to show band intensity approximately equivalent to 5αR1. Moreover, 5αR1 mRNA expression was significantly greater, whereas 5αR2 mRNA expression was no higher, in tumorigenic than in nontumorigenic cells . Similarly, in the present studies 33 cycles were required for 5αR2 in contrast to only 26 cycles for 5αR1 indicating that mRNA levels for 5αR1 greatly exceed those of 5αR2 in human breast tissue. It was also recently demonstrated by immunohistochemistry and RT-PCR that 5αR1 is the main isoform expressed in human breast carcinoma . Together the observations provide strong evidence that 5αR1 may be the primary 5α-reductase expressed in breast tissue. However, in contrast to prostate where no differences were found in 5αR2 expression between tumor and matched normal tissue  we saw significantly higher levels of expression of 5αR2 in tumor than in normal breast tissue in both the matched and unmatched breast samples. Therefore it is still possible that changes in 5αR2 mRNA expression have some relevance to progesterone metabolism in breast cancer. In the unmatched samples the levels of 5αR1 expression were not significantly different between normal (mostly reduction mammoplasty) and tumor tissues. Normal samples required large amounts of tissue to obtain sufficient levels of RNA for PCR analysis. Also, the unmatched tissues had been collected separately and the records do not provide information to determine if storage factors such as interval between excision and freezing may have been different. Another important factor may be the difference in age between tumor and normal samples; eight of the normal samples were derived from premenopausal women, between the ages of 19 and 35, a time when levels of steroid hormones and enzymes vary markedly during the menstrual cycle. Further investigations will be required to resolve differences in 5αR expression at different ages and different stages of the cycle. Mammalian 3α-HSO and 20α-HSO activities result in stereospecific and positional keto/hydroxy interconversions. The isozymes responsible for these catalytic actions have been cloned and they belong to the AKR1C subfamily or the AKR (aldo-keto-reductase) superfamily . Human 20α-HSO is formally AKR1C1, human 3α-HSO type 3 is formally AKR1C2 and human 3α-HSO type 2 (identical to type 5 17β-HSD) is formally AKR1C3. These human isoforms share common properties and 83 to 97% sequence homology [21, 22]. Despite their high homology, these isoforms display distinct differences in reactivity and substrate specificity and are expressed at different levels in different human tissues [23–26]. The expression of AKR1C1, AKR1C2 and AKR1C3 mRNAs has been detected in human mammary gland [24, 27–29]. AKR1C1 has predominantly 20α-HSO (but also some 3α-HSO) activity, AKR1C2 has predominantly 3α-HSO (but also some 17β-HSO and 20α-HSO) activity, and AKR1C3 has substantial 17β-HSO (and lesser 3α-HSO and 20α-HSO) activity [14, 28]. Our results show that the level of expression of these three HSO isozymes is significantly less in neoplastic than in normal (nontumorous) breast tissue from both matched and unmatched samples. 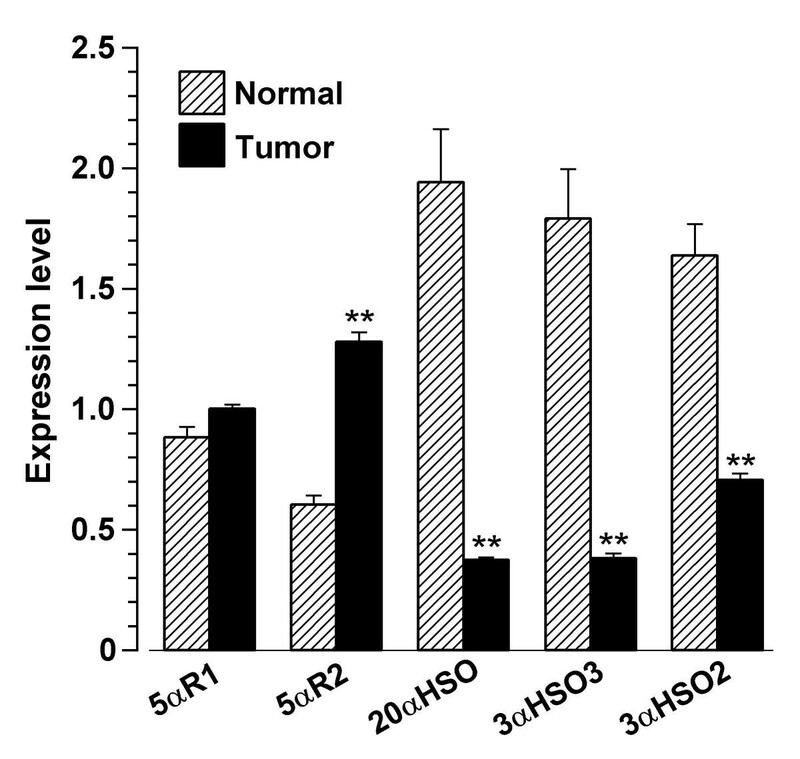 On average, the level of expression of 20α-HSO and 3α-HSO3 is 4–5-fold lower and that of 3α-HSO2 is about 2.5-fold lower in tumor than in normal samples. In a preliminary report in which tumorous tissue was compared to normal tissue in 24 paired cases, Stolz and co-workers, using real-time PCR, also observed that the expression of 20α-HSO (relative to RNase P) was significantly lower (>5-fold) in the tumor portion of the majority of the cases and nearly half of these also showed decreased 3α-HSO3 expression . Their results are thus potentially similar to ours with respect to AKR1C1 and AKR1C2. Moreover, they provided evidence that the reduced AKR1C1 gene expression is associated with decreased immunohistochemical staining in tumor compared to paired normal tissue. The reduction in 3α-HSO mRNA expression may not be confined to breast cancer. In a recent study  it was demonstrated that 3α-HSO3 mRNA expression is also lower in tumor versus normal human prostate tissue samples. The reduced expression of 3α(20α)-HSO isozymes and increased expression of 5αR isozymes in breast tumor reported here help to explain the lower and higher level of activity, respectively, of these enzymes observed in tumor versus paired normal breast tissue . Similarly, tumorigenic breast cancer cell lines (MCF-7, MDA-MB-231, T-47D) also exhibited lower 3α-HSO and 20α-HSO and higher 5αR expression than a non-tumorigenic (MCF-10A) cell line  and these differences in expression correlated with differences in respective enzyme activities . Both in the tissues  and cell lines [unpublished], the differences in activity were reflected primarily in higher amounts of 5αP and lower amounts of 3αHP and 20αDHP produced in the neoplastic versus the normal condition. Others [14, 28–31] have considered 3α- and 20α-reduction as catabolic pathways resulting in less active (or inactive) metabolites, thereby decreasing the amount of biologically active ligand available for androgen and progesterone receptor binding, respectively. Thus reduced expression of AKR1C2 in prostate cancer has been considered to be associated with reduced conversion of 5α-dihydrotestosterone to 5α-androstane-3α,17β-diol, thereby maintaining higher levels of 5α-dihydrotestosterone which is considered to have higher growth-promoting action . Similarly, conversion of progesterone to 20αDHP has been considered a means of decreasing the local progesterone concentrations . Instead of viewing the enzymes as regulators of progesterone concentration and the progesterone metabolites as inactive by-products of this catabolism in breast tissue, we propose that the primary function of the enzymes is to regulate the relative levels of the active 5α-pregnane and 4-pregnene progesterone metabolites. At least two of these metabolites, 3αHP and 5αP, have been shown to have independent specific and opposing activity with respect to breast cell proliferation, adhesion and cell cytoskeletal components [10, 11]. In addition, 3αHP and 5αP have separate specific membrane-associated receptors on mammary cells, which are distinct from estrogen, androgen, progesterone or corticosteroid receptors . Moreover, 3αHP has been demonstrated to exhibit meiosis regulating activity in rat testis , inhibition of follicle-stimulating hormone release in pituitary cells  via nongenomic mechanisms [34–37], and analgesic  and anxiolytic  actions in the brain. It appears, therefore, appropriate to consider at least some of the progesterone metabolites produced in breast tissue as active independent hormones, potentially involved in regulating breast cancer. 5α-Reductase and reductive 3α-HSO and 20α-HSO activities provide the major (if not exclusive) catabolic pathways of progesterone in breast tissues (Figure 7). The relative activities of these enzymes will determine the ratio of cancer-promoting 5αP with respect to cancer-inhibiting 3αHP and 20αDHP concentrations. The current findings of the decline in expression of the HSO isozymes in tumor tissue explain the lower levels of the cancer-inhibiting steroids in relation to the cancer-promoting 5αP. Increased expression in 5αR mRNA would further increase the ratio in favor of cancer-promoting progesterone metabolites. We have previously suggested that the change from normal to carcinoma and/or the promotion of the carcinoma may involve an increase in the local 5α-pregnane/4-pregnene ratio, in particular the 5αP/3αHP ratio. The current findings suggest that higher levels of 5αR expression and/or lower levels of 3α- and 20α-HSO expression in the tumor (as compared to the normal breast tissue) result in increases in local concentrations of cancer-promoting, 5αP, and simultaneous decreases in actively anti-neoplastic hormones such as 3αHP. The control of the expression level of individual progesterone metabolizing enzymes might therefore provide a mechanism of controlling breast cancer by controlling local concentrations of progesterone metabolites with opposite activities. It is known that the progesterone metabolite, 5αP, stimulates proliferation and detachment of breast cell lines, and thus potentially promotes mitogenesis and metastasis. The progesterone metabolites, 3αHP and 20αDHP, have the opposite effects by suppressing proliferation and detachment. Conversion of progesterone to 5αP is higher, whereas conversion to 3αHP and 20αDHP is lower in tumor than in normal breast tissue. Progesterone conversion to 5αP requires the action of 5αR (SRD5A) and conversion to 3αHP and 20αDHP requires the actions of AKR1C1-AKR1C3 (3α-HSO and 20α-HSO) isozymes. The results of this study show for the first time that expression of 5αR mRNA is significantly elevated whereas expression of AKR1C1-AKR1C3 mRNA is significantly decreased in tumor compared to normal breast tissue. The findings suggest that the shift in pattern of progesterone metabolism occurring in breast carcinoma may be due to altered expression levels of the progesterone metabolizing enzymes. Understanding what causes these changes in expression could help in designing protocols to prevent or reverse the changes in progesterone metabolism associated with breast cancer. This research was supported by grants to JPW from the Susan G. Komen Breast Cancer Foundation (# BCTR00-000805 #BCTR2000805), and from Natural Sciences and Engineering Research Council (#6865-99). JW conceived and coordinated the study, participated in its design, performed the statistical analyses and drafted the manuscript. ML carried out the RT-PCR studies and participated in drafting the manuscript. JGH provided pathological analyses and editorial comment. All authors read and approved the final manuscript.